UnLock Math is the first homeschool math curriculum to combine a variety of learning styles into one in multi-sensory and interactive curriculum. Alesia and Matthew Blackwood have designed a creative program from homeschooling families unlike anything on the market. It is evident throughout Alesia’s work that she understands the struggles math students face from years in the classroom. Students shouldn’t have to struggle through their math careers from such and early age; Alesia conveys her enthusiasm for math in such a way that it gets your child excited to master new concepts. Who would have thought that after so many years of struggling, math doesn’t always have to be the “dreaded” subject! I have outlined below some of the key features that I think sets UnLock Math aside from other programs on the market and shows you that you are in fact getting the most “bang for your buck” with this curriculum! Engaging Videos – Acclaimed math teacher Alesia Blackwood engages your child with fun video lessons; her energy engages students and keeps their attention while breaking down new math concepts into easy to understand “bite-sized chunks”. Intelligent Platform – In partnership with MapleSoft, UnLock Math provides you with top of the line automatic grading unlike anything on the market today. The students work is graded immediately with feedback after every question! These features allow you to assess your child’s understanding of math concepts with multiple question types, not just multiple choice. Natural math notation is used in both the question text & student response. This easy-to-use equation editor makes it simple to enter mathematical expressions. The adaptive math questions guide students into deeper understanding when it comes to mathematics and leaves all the frustration and tears behind! Unlimited Practice – UnLock Math gives your child unlimited practice which is ideal for mastering concepts. Your child will see one math question at a time and after each one is completed; detailed feedback is provided to help your child better understand the new math concepts before moving on. Not sure if your child fully understands the concept at the end of the lesson? Just go back and try a fresh set of questions! The program will keep the highest overall score, which means students can only improve when it comes to understanding math! Immediate Feedback – UnLock Math gives your child immediate feedback with completely worked solutions after each question. As mentioned earlier, this is one of the features that sets UnLock Math apart from other programs. They provide a variety of question formats and present them to the student one at a time. This prevents your child from getting overwhelmed and frustrated by the work load for each lesson. Continual Review – UnLock Math gives your child continual review making sure concepts get locked into long-term memory. Many math programs on the market today explain concepts and move on to the next without working and engaging with students personally. Students are more likely to remember and recall concepts that have moved from short term memory to long term. UnLock Math helps students achieve this with continual review. You set the pace for your student and move on when you feel they are ready and capable! Automated Grading – UnLock Math takes care of ALL the grading for you & includes detailed reports. It can be hard to balance homeschooling life as a parent; UnLock Math makes the grading and record keeping easy for you. New customers are provided with a student AND a parent login which allows parents to access their child’s grades and progress reports. These are all printable and easily accessible at any point during the school year. Spend your free time doing something you love and worry less about keeping records! Reference Notes – View online, print out one by one, or print all at once and have your very own UnLock Math textbook! This is such a great tool to have in addition to the online videos and questions. Each lesson’s video follows along with the notes so for extra practice students can read along and make their own notes! Not only does it help the student but as a parent you can follow along too and find any topic or concept if a problem comes up! Extensive Reporting – You’ll be able to view, export, and print detailed progress & grade reports at any time! As student’s complete work, all their grades are instantly tracked and saved in real time, so you can go in at any time and view your child’s progress. Online Chat – Direct access to teachers for extra help is just a click away! Another feature that sets UnLock Math aside from the rest is that they have an online chat that allows you to contact certified teachers at any point during the course to answer your questions. This feature isn’t just limited to students either! If you’re working with your student and have questions about anything, we are always happy to assist you! With UnLock Math you’re never left on your own! 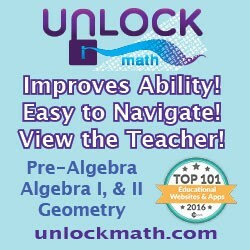 Unlock Math removes the guesswork and frustration from learning middle & high school math. They claim to transform how your child approaches math through Alesia Blackwood’s engaging teaching style. We are sold! It is so easy to navigate, everything is laid out in a fluid and logical fashion. Through the whole program it’s apparent that as a homeschool family themselves they strive to make their customers lives a little easier! They have so many layers and extra features unlike anything else on the market today. They’ve seemingly thought of everything to make math a smooth sailing subject in your home, all you need to do is set your student up and let them log in and learn!